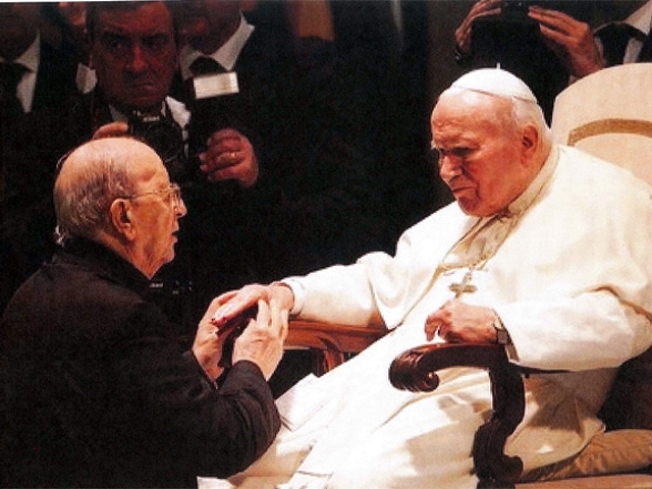 Reverend Marcial Maciel, left, with Pop John Paul II. A man who claims the founder of a Catholic order was his father has filed a lawsuit against the religious group, claiming the priest molested him for years. Jose Raul Gonzalez, 30, of Mexico, on Monday filed the claim of fraud and negligence in Connecticut against the worldwide Legionaries of Christ, according to his attorney, Jeff Anderson. The order has its U.S. headquarters in the state. Gonzalez' mother has said the late Rev. Marcial Maciel led a double life, had two children with her, adopted another, then sexually abused two of the three. Lara Gutierrez said she was 19 when she met the priest, then 56, who passed himself off as "Jose Rivas," an employee of an international oil company, a private investigator and a CIA agent. She said she didn't discover his real identity until 1997, through a magazine article. After decades of denying allegations of abuse against Maciel, Legion officials have recently acknowledged the priest fathered at least one child, a girl who now lives in Spain, and sexually abused seminarians. Maciel died in 2008 at age 87. A U.S. spokesman for the Legion, Jim Fair, said he could not comment because he had not yet seen the lawsuit. The Vatican had conducted an investigation of the Legion and concluded last month that Maciel had committed grave and "objectively immoral actions" that constituted true crimes in some cases and showed a "life devoid of scruples and authentic religious meaning." According to a statement from the Vatican, Maciel created a "system of power" built on silence, deceit and obedience that enabled him to lead a double life that allowed the abuse to go unchecked and unquestioned. Previously, Maciel enjoyed favor at the Vatican under Pope John Paul II, who admired the order's conservative outlook and its success in fundraising and recruiting seminarians at a time when the ranks of priests were dwindling.